Pacific Controls provides advanced analytics and embedded intelligence from the building to the edge of the Smart Grid, using an End-to-End Building-to-Grid (B2G) Services platform which includes a fully integrated energy management system. Pacific Controls provides advanced analytics and embedded intelligence from the building to the edge of the Smart Grid, using an End-to-End Building-to-Grid (B2G) Services platform which includes a fully integrated energy management system. This provides adaptive and dynamic energy-efficiency improvement, continuous commissioning, fault detection and diagnostics. 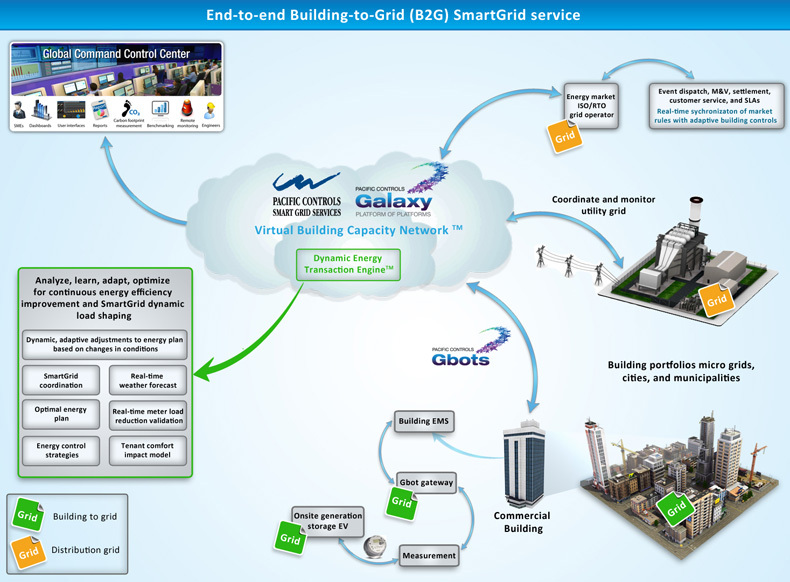 It delivers energy optimization and integration with the Smart Grid to achieve increased comfort, safety, energy efficiency, and cost reduction. The Dynamic Energy Transaction Engine allows the platform to manage the complexity of energy market rule execution and match it with optimized building energy load controls. This creates energy capacity on-the-fly based on lowest energy cost; reduces carbon footprint, and increases grid reliability. Using this service removes the problems associated with obtaining these benefits for building owners and utility operators.